At this time of year, when many of us are going on our holidays, you have a multitude of things to consider. Not only do you have to think about your home security when you’re away, but you also may be considering how to make your time travelling more secure too. You hear the horror stories of suitcases not making it to their destinations, or the half opened suitcases in disarray as they go around on the conveyor belt. So what would a padlock really offer you? 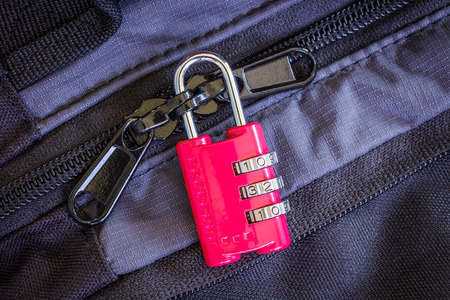 Do padlocks give you any more protection? Firstly, a padlock cannot not prevent your suitcase going missing: it’s not that effective! However, padlocks are effective deterrents, which in some cases may prevent your suitcases from going ‘missing’. Padlocks will also prevent anyone from trying to have a peek at your luggage, which may have resulted in some items disappearing. Padlocks are an effective deterrent; a high quality lock will deter and prevent someone being able to access your suitcase. If there is an emergency, how will officials get into my case? In some cases, there are emergency drills which may have absolutely nothing to do with you, but everyone on your flight needs to have their luggage searched. So what happens to your luggage, I hear you say. Unfortunately, your lock will either be broken or in the worse possible case, your luggage will be cut in to. These occurrences are rare, very rare. However, it is in the interest of yourself and every person present to ensure that you are safe and to demonstrate the effectiveness of airport security. Any losses will be covered by your travel insurance. Can I take more security measures in addition to a padlock? Of course! A padlock could be the first of many preventative measures. Firstly, ensure that you have travel insurance, as some things are out of your control and travel insurance may be the only thing to rectify any losses etc. However, in addition to your padlock, you could use subsequent deterrents. For instance, a suitcase strap across the body of your case can act as an effective precaution, or alternatively use bungee cords to keep your case more secure. These will deter anyone from getting in, especially if coupled with a lock: who has the time and effort to try to break into a potentially fruitless case? In the interest of a ‘fruitless case’, keep all important documentation, money and any valuables in your hand luggage—but you know that anyway! Does the price of the padlock really matter? Not necessarily. However, the price tends to reflect the quality: the higher the price, the higher the security. Look for the security rating and the suggested use for the lock in question. It may be worth speaking to a professional and seeing what they would recommend. There is absolutely no point spending a fortune on a lock which is not particularly effective or practical for your situation. What if I lose the key or forget the combination? Locks which come with keys, come with a spare. If you are travelling with someone, it may be worth you both having a key, just in case. Keep them safe, with your passport and other valuables. If you arrive at your destination and you have both lost the keys, then at this point you will probably have to try and break the lock off. Hopefully this does not happen! However, if you are at your destination, then there isn’t much of an alternative. In the case of combination locks, again if you are travelling with someone, tell them the code. Also, write it down on a small piece of paper and keep hidden with your valuables. There is no issue writing it down or saving it in your phone as your hand luggage will not leave you. If you both forget or lose the combination, then as I have formerly stated, breaking the lock will be the only option. If this happens when you are coming back from your trip, then seeing a locksmith may be a route to take, rather than breaking the lock or damaging your luggage.